We discover the top 5 programs amongst modern DJ's with a guide on finding the best software for your needs. And for anybody new to digital DJing, we explain what it's all about! We've found Serato to be the most popular, but which one will you choose? If you've been searching for the best DJ software you'll know that there's an abundance of creators claiming to have 'the best'. Just a quick search will give hundreds of results. And you'll find it hard to narrow it down to the one that ticks all the boxes. The easiest way to find the best software is to find out what the top DJ's are using, and create a list. So that's what I've done. Whether you're a complete beginner or a festival DJ, there's something here for you. Before we get to the software lets learn a bit about digital DJing to help anybody that's new to this. After all, you want the best DJ software for yourself, so you need to know what to look for. If you've made it to this article and you're new to this you'll probably realise that DJing isn't what it used to be. As fun as they are, you no longer have to use turntables, CD decks, mixers and controllers to get the party started. Gone are the days of spending thousands on vinyl records and carrying a huge flight case of records to every gig. Even the days of the CD are limited and many DJ's will now only take a couple of USB sticks to a gig. Enter the world of the digital DJ, a world where you use a computer or device to emulate a traditional DJ set-up! But what if you want to use DJ software but can't stand the though of parting with your wheels of steel? Or maybe you're an aspiring turtablist and would rather scratch and juggle vinyl? Software is ever changing and improving, and many programs will now let you use the software in conjunction with your traditional DJ set-up. Basically letting you control the music in your playlist with your turntables. Or even by using simple plug and play controllers which plug straight into your USB port and work in conjunction with the software. How cool is that? But digital DJ software has mixed opinions and is a sore subject with many traditional DJ's. If you talk to most hip hop DJ's you'll discover that a digital vinyl system (DVS) is as far as they'll go. And if you mention the sync button they'll turn their back on you. Many argue that digital DJ software takes away many of the necessary skills needed in DJing. Whereas people in favour will see options like the sync and auto mix function as a necessity. A feature that leaves more time for DJ's to get creative with the mix and all of the software's features. Whatever your opinion, digital DJing is now bigger than ever and will only get bigger. It's opening up new opportunities to people that would never have been able to DJ in the traditional way. This may be because of the cost, or because of the space required for a traditional set-up. How to find the best DJ software. To find the best DJ software you need to find out what you can expect from the software. And then decide if it will offer all of the features that you need. Software can be pricey so it's important to make the right choice to avoid buying twice. Consider exactly what you need and what features the software offers. Some interfaces are more feature packed than others. And many are complicated and are very messy. For me there's nothing worse than a cluttered screen. Some programs allow you to remove features that you don't use to give you a more clean looking layout. You'll be spending a lot of time using the interface and looking at the screen, so something easy on the eye is important. Small icons and a cluttered screen can strain your eyes and makes for an unpleasant experience. Once you're happy with the overall look, what about effects, samples and the ability to create loops? Is this something you need? And how about the ability to arrange your music library to make tracks easier to find when you're deep in the mix? If you need extra features you want a program that makes these features as easy to access and use as possible. Make sure it fits your budget. We'll be looking at free DJ software later so you may be in luck. If you're buying software you may only consider the price of the program, but will you need additional hardware? You need to decide exactly what you will be doing with the software. Do you need to buy a controller, a sound card, and will you need a DVS? All of these options will increase your final overall price. And for advanced options like a DVS you'll need timecode vinyl and you may need a software add on. Some controllers come bundled with a free key to download and install software. So take this into consideration as it could save you money. Many software creators will also let you download a free or demo version of their program. This will give you an idea of what to expect before you pay to download the full version. Is the software compatible with your equipment? Some types of software will only work alongside specific brands of hardware. Will the software be compatible with you're kit, and will you need to buy a sound card? As mentioned earlier many controllers or mixers come with software, but the software may only work with that specific brand. So if you have other kit that you'd like to hook up, this could be an issue. There are lots of things to think about so we'll give an overview of each brand of DJ software. This will help you to find the best DJ software for your needs. So let's get to it! First up is a freebie! 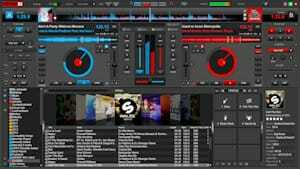 Mixxx 2.0 is my top choice for the best DJ software that's free to download. It's available for Windows, Mac OS X and GNU/Linux. The software has been developed as an open-source project bringing together the knowledge of dozens of DJ's. It's very popular and receives over one million downloads per year. And in 2011 it reached number one for the top free app in the USA, Germany, and Italy. Mixxx is also the only free software that includes free timecode vinyl control. This means you can use it to play tracks directly from your computer using encoded vinyl, aka DVS control. And what's great is that the Serato scratch live (CV02) timecode vinyl works perfectly in conjunction with it! It also has an impressive list of supported controllers to allow a simple plug and play option. 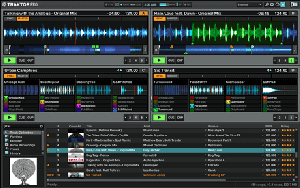 The Mixxx interface features control of up to 4 decks with a simple mixer layout. You'll find a 3 band EQ with gains to create smooth mixes while keeping your levels in check. There's a headphone monitoring panel and a full waveform of your track. Mixxx will also accept microphone input to keep the mobile DJ's and house party DJ's happy. The deck section features the track name, track length, track remaining timer, BPM counter, play/pause, and cue buttons. There's also a master sync button to keep all tracks beatmatched. You can also add loops down do 1/8 of a beat, and samples. After the main deck section you will see a set of four sample decks. These let you drop in vocal hits, air horns, DJ name drop samples, etc. These can then be assigned to any deck at any time during your set. There's also RGB waveforms, these show a different colour depending on the frequencies in the selected track. So for example, red would mean bass, blue means highs, and green means vocals. Key detection will show you the key that each track is recorded in. This gives you the ability to create the perfect professional sounding harmonic mix. And you will get a big bank of effects to help you get creative with your sets. If you're feeling lazy there's even an auto DJ or auto mix function to do the work for you! You can also record your mixes and even stream them live over the internet. If you fancy a change of interface you can choose between three different skins. These can be stretched to whatever size screen you have. And you can also configure the interface to your liking. You can do this by taking away certain sections. This allows you to keep it as minimal and as easy on the eye as you like. The library also has some great features including crates for different sets, genres, of BPM's for example. And a playlist creation window so you can create track lists before gigs. It supports a wide range of file formats and even has iTunes integration. This will let you drop tracks straight from your iTunes library into your mix. It also supports the Traktor library, Traktor is another brand of software that we'll get to later. Overall this is a fantastic program with features that you wouldn't expect to see on free software. Perfectly beginner friendly as you can make the interface as simple as you like. And also suitable for advanced DJ's, and hands on DJ's with the inclusion of controller and DVS control. Check out the Mixxx website here for more info. 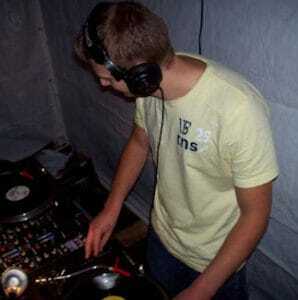 Virtual DJ from Atomix Productions first came onto the scene way back in 2003 taking over from AtomixMP3. AtomixMP3 was first released in 2000 meaning they were at the forefront of DJ software. The very simple AtomixMP3 was discontinued as soon as virtual DJ was released as its successor. In 2013 it won the award for Best DJ Software at the international dance music awards winter music conference in Miami. 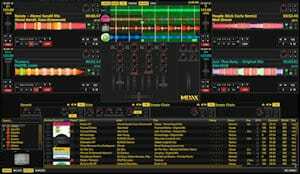 Virtual DJ is available for PC or Mac and the current version Virtual DJ 8.2 was released in 2016. Virtual DJ is available for free, but this is for non commercial use only. If you want to plug in hardware like controllers, the free version will only allow this for 10 minute periods. This is to prevent commercial DJing. If you want to use it for gigging or with controllers you will need the full version. When you buy the full version of virtual DJ there is a free upgrade policy. So this means Atomix will upgrade you for FREE every time there is a newer version released. This is a great selling point for the software and really shows how much the company value and respect their customers. There are many add-ons available for the software including video DJ, and DVS control. Atomix also sell control vinyl via their website. The interface is very clean on a dark grey background and is very easy on the eye. Half of the screen is dedicated to the music library and the other half is where the magic happens. The deck section features a simple drag and drop function to quickly load up your chosen track. As it loads you'll see a waveform loading up at the top of the deck and at the top of the screen. The waveform at the top shows a close-up with a combination of both decks scanning right to left. This is to aid with beatmatching, and the waveforms are easily identified by the colours red or blue. Once the track is loaded you'll see track info including the name, length, BPM, time remaining, etc. And for anybody into harmonic mixing you'll also get the track key info. There are play/pause cue buttons at the bottom and a sync button. If you're not a fan of sync there are also pitch faders for beatmatching. Below the faders there are +/- buttons for changing the speed in smaller increments for more precise beatmatching. And Just like Mixxx we get an auto mix function that can be edited to our own settings. So we can set mix in/out points and set volumes etc. If you're feeling lazy you can use the smart mix option to automate every mix. Or a there's a simple non mixed track to track selection. This is for things like birthdays parties at home when mixing isn't necessary. You'll have a sampler with some built-in samples like air horn, siren, and explosion. A really cool feature it the sample editor where you can drop a whole track and grab small samples. So if you wanted to use a vocal sample for example, this would be a great useful feature. You can also create voice drops using your microphone. Simply record your own vocals using the record button on the mixer, and play them back as a sample. Something that makes Virtual DJ very popular with mobile DJ's is the video mixing window. This feature lets you stream music videos while you mix. Many mobile DJ's use this feature with a projector to bring the dancefloor to life. The software also lets you link both the audio and visual mixing crossfaders. This makes them work as one so you can mix both audio and video simultaneously. To the side of the deck section you'll see the hot cue, effects, and loop section. You can set up to 6 hot cues via the interface or more using your controller, mixer etc. Here you can also set loops and auto loops with the ability to set the size, length, and number of beats etc. There's also a big bank of effects to add to your sets including reverb, echo, distortion etc. And if you're using windows you can import VST plug-ins to add even more effects. A really cool feature of virtual DJ is the Sandbox Mode. This lets you practice the mix in your headphones before actually executing the live mix. So you can test out what a mix might sound like before actually outputting it through your main speakers. This let's you find the best possible points of a track to transition and eliminates live trial and error. Overall a very feature packed program with lots more to offer than we've just mentioned. And it could be the best DJ software for the mobile DJ's amongst us. You can find controllers that are fully compatible like the super popular budget priced Pioneer DJ DDJ-SB2. This controller is sold as a Serato controller but works perfectly in conjunction with Virtual DJ. Or the Numark Mixtrack 3 that comes bundled and ready to plug and play with Virtual DJ. 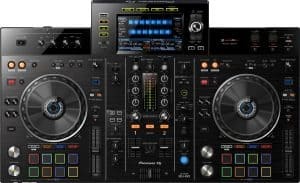 Check both of these out and compare prices on Amazon here -> Pioneer DJ DDJ-SB2 and Numark Mixtrack 3. Cross DJ was first released in 2008 by a french company called Mixvibes. The Mixvibes team are well known for coding and producing Pioneers fantastic Rekordbox software. Cross DJ is available for PC, Mac, iOS, and Android. It features DVS timecode vinyl control, video DJing, and more. It's also compatible with a long list of controllers that you can see here. We'll be concentrating on the app version of Cross DJ but you can download a free version of the PC/Mac software here. 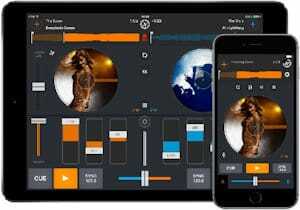 The iOS and android Apps both offer a simple interface with 2 deck and mixer view. You can use the app in portrait or landscape view but landscape is the easiest. Portrait only shows one deck at a time so you'll have to keep hitting the A/B buttons to select your channel. Something really cool is the Mixvibes Soundcloud link-up. This lets you find your own tracks stored in your soundcloud account and throw them into your sets. When you're ready to start a DJ set you can easily load tracks by clicking the plus buttons at the top of the screen. This will show you a view of you device’s Music folder where you can simply select the track you want. Once the track is loaded the waveform overview will show up above the deck. If you touch the waveform you can drag your finger along it to search through the selected track. This lets you quickly jump to a certain point of the track. You can also touch the deck to scan through the track, or to scratch. When you click the cue/loop button you'll be able to set up to 8 hot cues and create loops and auto loops. Below that, the FX button lets you control FX with a simple XY touchpad. Here you can choose from a bank of effects that you can control by moving your finger around the touchpad. And below the FX button you have a sampler that will let you trigger things like horns and scratch sounds. You can also create your own sample bank and add your own samples to it. And you can even record your own vocal hits to drop into your sets. The interface is pretty simple. There's a 3 bandEQ, volume control, cue, play, and sync buttons, and pitch sliders. And at the top there's a waveform section that also shows you track info. You can also record your mixes by clicking the record button between the two waveforms. 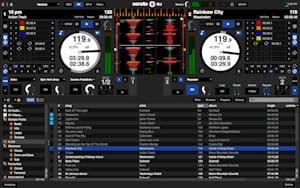 Overall a nice easy to use app, that could be the best DJ software for house parties, birthdays etc. If you need a more complex software the desktop version of Cross DJ is great and offers lots more features. You can get the full mixvibes package on amazon for a great price. This includes the FULL software, a sound card (interface), timecode control vinyl, control CD's, and leads. You can find out more about Cross DJ at the Mixvibes website here. Serato audio research is a New Zealand based company founded in 1998. They specialize in vinyl emulation and are a favourite among scratch DJ's and turntablists around the world. Serato DJ won the best DJ Software award at the DJ tech awards in 2014 and continues to impress. This software really is what you'd expect from 2 decades of research and comes packed with innovative features. The dark interface is pleasing to the eye and not too overwhelming considering how feature packed it is. Serato DJ Pro lets you control up to 4 decks at one time using a simple drag and drop track selection feature. Once the track loads up you get lots of track information at the top of the deck section and on the deck overview. You can see things like track name, BPM, track time, track remain, pitch percentage, and a set of VU meters. You have a sync option that works great alongside the quantize mode. This keeps every beat locked in and perfectly beatmatched and in time. If you don't normally use sync this is still useful for exiting loops and dropping cue points perfectly on beat. There's a massive bank of 22 FX and you can even buy very reasonably priced add-ons. This lets you add up to a total of 67 effects! There are also many more add-ons like Serato video, Serato sample, and Serato DVS. A really great feature of Serato DJ is the beatjump control. This lets you quickly skip through a track in 2,4,8,16, or 32 beat steps. This a great for skipping large amounts of a track while staying perfectly in time. This is handy for cutting out long intros for example, or you can use it while in the mix. If you have a track with a very short intro you can use the beatjump to jump back a few beats while you are transitioning. The beats stay perfectly locked in and beatmatched. This is kind of like creating a loop but everything is done manually and with a simple click. The waveform section is customizable and you can chose to display them horizontally or vertically. You can even display them in an extended mode that fills the whole of the screen horizontally. This can help with manual beatmatching and also lets you see a lot more of the track. The library section as been well thought out with a ton of features, my favourite is smart crates. Smart crates find targeted information within a music track, it then groups them all into one easily accessible folder. Simply set the crate rules, for example tracks over 115 BPM, then all tracks over 115 BPM will appear in the crate. You also have the ability to easily import your entire iTunes library and its playlists. Here you'll have ID3 tag editing options to edit track information, set preparation windows, set history folders, and more. Serato DJ Pro is also compatible with a huge list of controllers, mixers, CDJ's, effects machines, turntables, and drum machines. You can also get budget controllers that are bundled with Serato. Other compatible controllers include the feature packed Pioneer Pro DJ DDJ-SX2. Or the Pioneer DJ DDJ-SR2 that both have dedicated buttons for Serato DJ! Overall a fantastic fully loaded feature packed program with a lot more to offer than listed above. This could be the best DJ software for beginners right through to advanced DJ's. You can find out more by seeing my post Serato DJ VS Traktor Pro 2. Or you can visit the Serato website here. Serato also have an awesome app called Serato remote that can be used alongside the software to trigger hot cues and effects. Traktor has been another very popular choice for DJ's over the years. And one that's given Serato DJ a run for it's money in it's goal to be the best DJ software on the planet. Native instruments is a German company founded in 1996. They were originally known for their software instruments, but now cover various music segments. The company are well known in the DJ world and first released Traktor back in 2000. Since then Traktor has gone through major changes to become one of the most popular programs in the world. It's won multiple awards including the DJ tech award In 2009 and 2010 and continues to improve. Traktor Pro 2 is the current version. Its interface is very similar to Serato DJ with its dark background that is easy on the eye. It's another program that could easily appeal to all skill levels and all types of DJing. The interface can be switched between 4 layouts and you'll be able to add of take away options. This means you can make it as minimal as you like depending on your needs. Traktors deck section offers up to nine options for track information including the usual track name, time remaining, BPM etc. The waveforms are totally customizable and you can chose whatever colour you like. You can also see your tracks frequencies in colour thanks to the RGB waveforms. Down below you can add up to 8 hot cue points, create loops, auto loops, and add effects from a very big FX bank. And you have an awesome feature called the sample decks. These decks let you drop in samples that will sync to the track you are playing. You can then edit the sample and add effects on the fly. You can also drop in and edit loops. This will allow DJ's to produce live remixes and get very creative with the software. Something new to this version is the stem deck feature. Traktor can playback a special file that is called a stem file. These files contain a music track that has been split into four sections. For example bassline, drums, melody and vocals. These will all display as separate waveforms in the stem deck window. You will be able to control each section separately and mix different stems together. So you could take the drum and bassline stems from one track and mix it with the vocal of another. You can get really creative and produce your own mash-ups and remixes from inside the software. You can also pair Traktor with a midi controller like the Traktor Kontrol S4 MK2 to control stems manually. The library section of Traktor is very well thought out. It gives you the ability to easily access your iTunes library from the included iTunes folder. You can easily save playlists, recordings, and set preparation lists. The library also has lots of cool column features like rating systems, play count, and cover art. You can also add or remove options just like in the deck section to clean-up your screen. As we just mentioned iTunes, you'll be happy to know that there's a Traktor DJ app for your iOS device. This app is pretty amazing and is very feature packed. You can find out more about the app here. Native instruments ensure us that Traktor works with all DJ controllers and they even offer a range of their own. These controllers will work seamlessly in conjunction with the software and it's features. They include fully loaded feature packed controllers like the Traktor Kontrol S8. And even cheaper budget controllers like the Traktor Kontrol S2. You can find out a little more about Traktor Pro 2 and it's special stem deck feature in my full guide/article HERE. 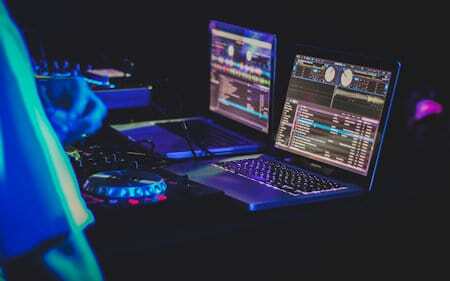 The article also gives a great comparison to the Serato software. Overall this is a fantastic feature packed program that offers more features that I can fit onto this page. Check out the full features of the Traktor Pro 2 software on the Native instruments website here. Thanks for checking out this list of the best DJ software, to use software you'll need a good set of headphones. Check out the best headphones on the market along with a full buyers guide to DJ headphones > HERE. If you're new to DJing you'll find lots of helpful advice on this site. Start off with my article on mixing > HERE. Which program do you consider to be the best DJ software available? Let me know below.